We used a dozer to skid the logs for the first two days. Day three we used my jeep…fun! I got to drive instead of set chokers. For those of you who don’t know what a choker is…its usually a cable…you loop around the end of the log then connect to your jeep or dozer. Sometimes I would set three chokers at once. Then have to drag three chokers back down to the fallen trees to do it all over again. Each choker weighed maybe 15 lbs. All day was quite the test. Again also… satisfaction. 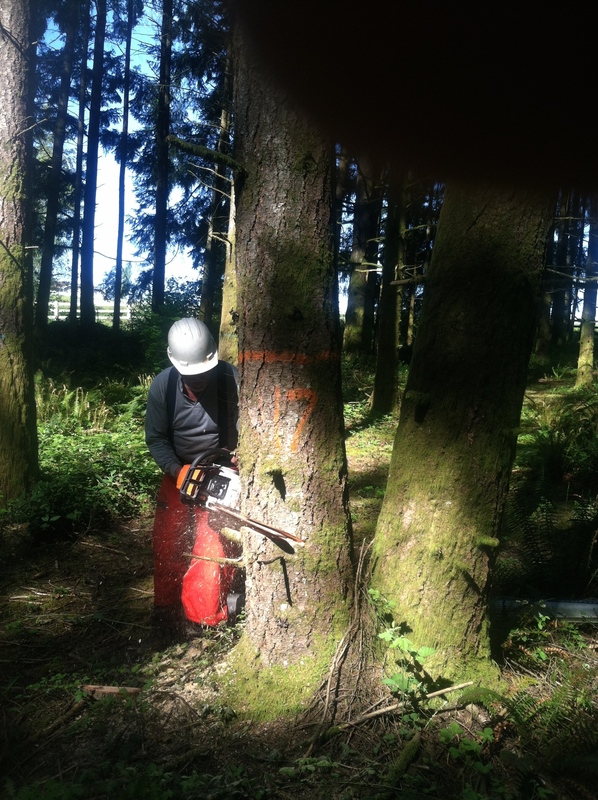 We contracted with a man one hour away from our property to purchase 25 Douglas Fir trees 10″-18″ thick and 6-8 8″ trees for rafters. We paid more than the ‘timber world’s going rate’ of $3-400(changes daily) per 1000 board feet. 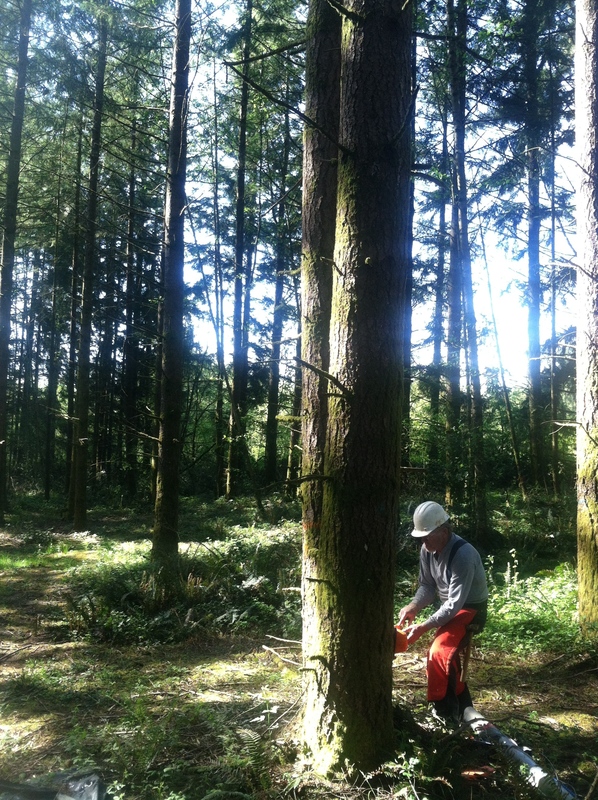 However, you need premium logs…straight and with little taper if you want to build a log cabin. Most of the trees I purchased had been marked by a local utility yard as possible poles(to be used for utility poles…straight and little taper). The problem with selling trees to a utility is that it’s not until they are brought to their yard and processed that you are positive they will pay you for them. In other words…they reserve the right to ‘reject’ trees that don’t ‘make the cut’. Thus you never know which trees they will actually pay you for. Not a great prospect. 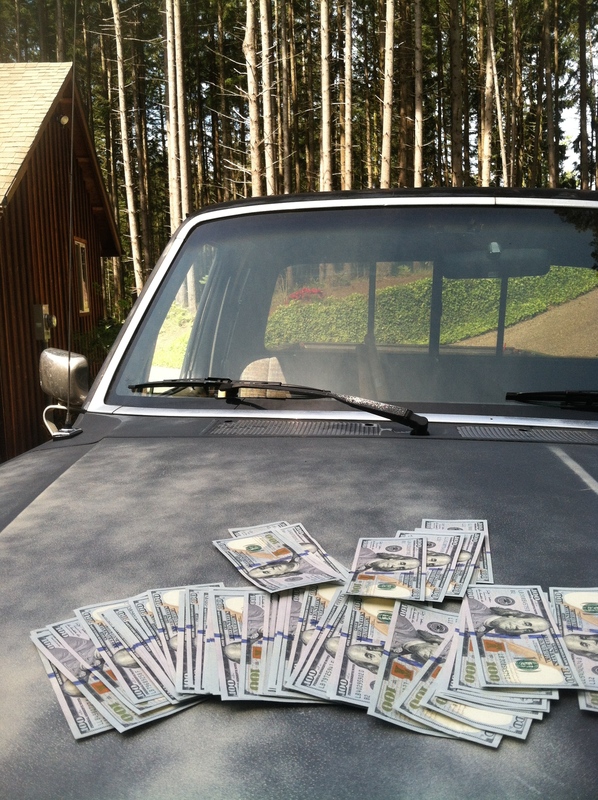 That is why my seller chose my cold hard cash over the utilities shaky deal. As we were falling trees I noticed that Terry was falling them accurately. So I decided to place my GoPro out where he thought the next tree would fall. You gotta see this vid! The tree lands ____”…no, I better not give away the ending:) Enjoy! The process of falling, limbing, cutting to length and skidding the trees out to the landing was probably the toughest work I’d done in 20 years. But the most rewarding! I was involved in building my own log cabin…not from a ‘kit’ but FROM SCRATCH! I may have been beat and bruised…but the satisfaction I felt erased my aches and pains. We used a dozer to skid the trees out to the landing where we cut the trees to length for my garage dimensions…also so they would fit on the logging truck. We bought 28 acres and decided to clear one acre for our garage and cabin. Warehouser had logged the property in 2006 so it will be another 30 years for the trees to be harvestable. Not probably going to be logging when I’m 90 so I’ve come to terms with buying my trees elsewhere. Bonnie and I walked through the 12′ high newly planted douglas-fir trees trying to visualize where our buildings would sit. Our friend Ken was scheduled to bring his huge excavator out in a few weeks but I couldn’t wait. So I started in with my chainsaw and jeep. 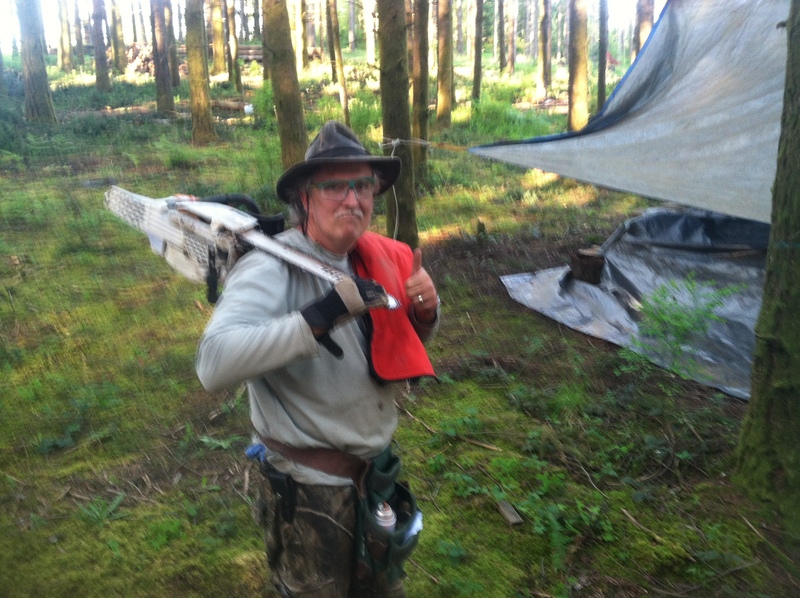 I’m sure glad Ken showed up when he did…it was slow going doing all the clearing by hand. It makes you appreciate how hard the pioneers must have had it back in the day…and they even used hand saws! After Ken showed up things went quickly. Everything opened up nicely and we could see much better where the cabin and garage would go. With a real steep bank on our north we had to hire a GeoTech to tell us how close we could build our cabin. 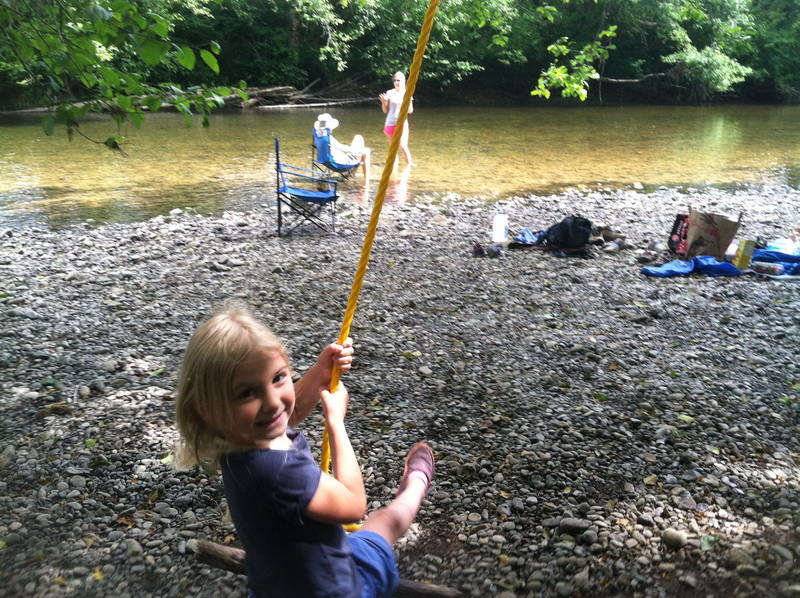 60′ Originally I wanted to build our cabin so close to a river/creek that we could hear the water rushing by. But after looking at so many properties I realized that it would be hard/expensive to find such a property. River front property is either in the lowlands or in a ravine. Both have their problems…lowlands are difficult because of flooding…ravines provide little sunshine. So we are happy to have compromised. We have half a mile of river most of which is wild and hilly so even though we could have built down by the river we decided to build up on our knoll…with a wonderful view of the Olympic mountains! My plan is to eventually build a gazebo or even a tree house down by the river. During the clearing process we collected enough trees and bushes to create two very large piles(approx 30’x20’x12’high). I hadn’t planned on the burning of these piles to be any problem at all. Hummm… I started out early one morning before light…thinking I’d be done by evening. Not only was it not totally burned by that night but it took three more days to finally call it done. During that time we had to get creative. We rented a gas powered industrial fan to keep the air flowing good and thus causing a nice ‘hot spot’. We also used a bug sprayer to add diesel to the fire…Bonnie seemed to enjoy the pyrotechnics! 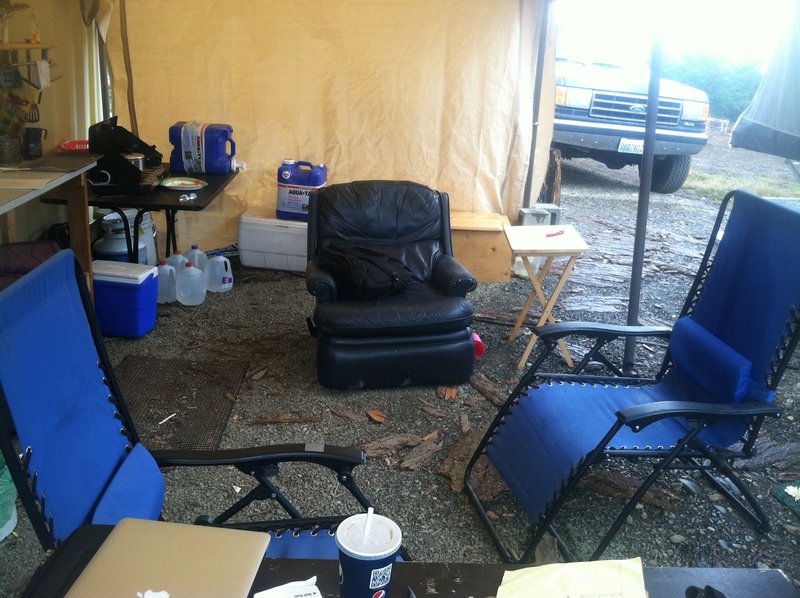 The process of building our ‘camp’ lasted most all of the first summer. We started with just our pop-up and a tarp. 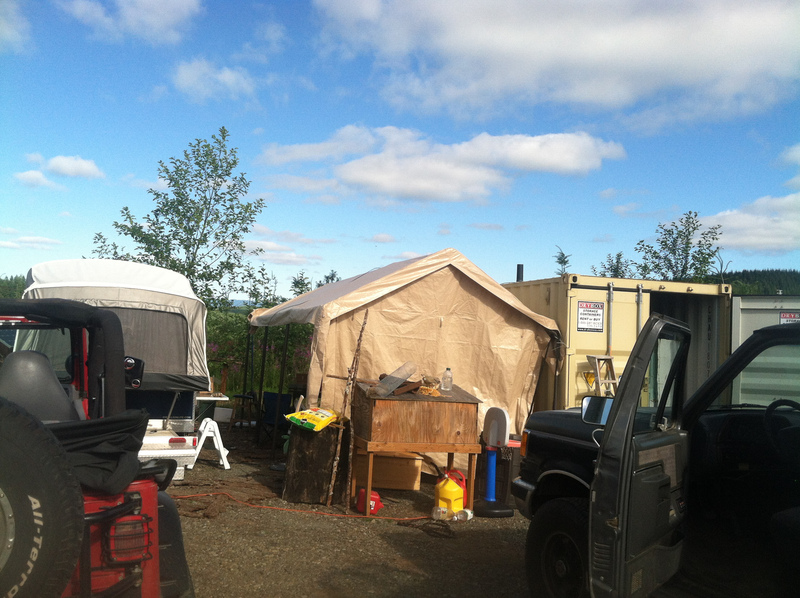 Then added the 10×20 container for tool storage then added the 10×20′ carport for shelter. 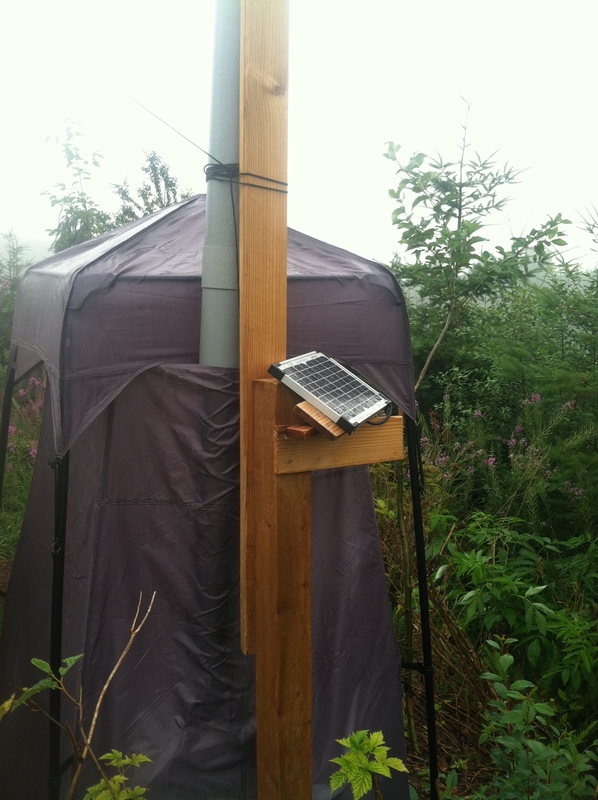 We were able to use the internet because of our satellite dish and solar panels to provide power. 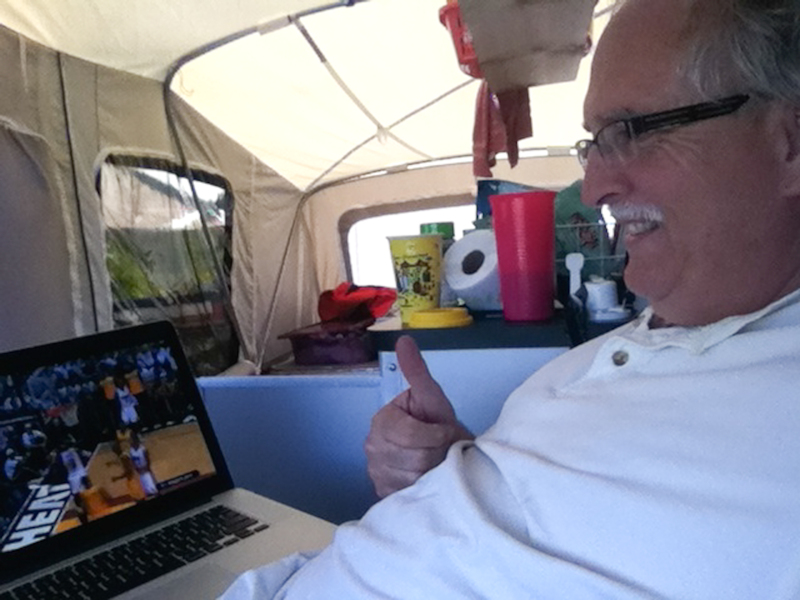 Bonnie had to keep her business running over the net and I had to watch the NBA playoffs. Seriously, it was valuable for the property development issues we ran into on a daily basis. Part of the fun for me was that every day was about SOLUTIONS. How to solve different problems and issues. The same conveniences you enjoyed ‘at home’ were not present ‘off the grid’. Couple that with the fact that I had never acted as my own GC(general contractor) and it sure made life interesting. I loved it! If any of you know the Pacific NW at all you will know that it rains…a lot. This first summer I was on site by the middle of April to fall trees. Bonnie was still in Florida taking care of business and ‘missing’ the beautiful wet weather. The following clips show me documenting what she is missing. Enjoy. I think I’m funny so please don’t tell me otherwise…it will crush me. Bonnie and I LOVE visitors! In fact we hope to use this property as a sort of ‘retreat center’. A place where people can come to ‘get away’, relax, recharge and just plain enjoy nature and the beauty God has created. Family visits were our favorite. Briana brought our two grandkids out several times. What a cool place. This snag is only 100 feet from our cabin. 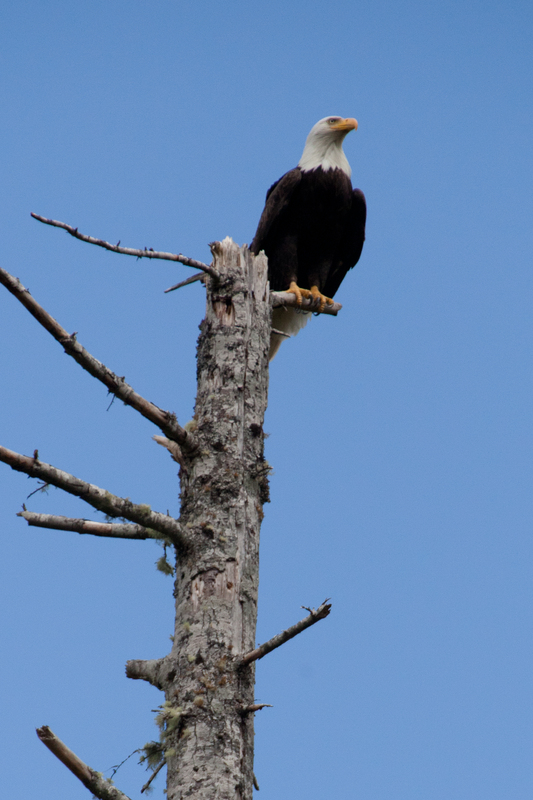 Eagles and other wildlife frequent the property. Early in 2014 we closed on our 28 acre paradise. I began working on details from our home in florida. I built a timeline according to how I thought the summer would flow. Most of my friends warned me that it would take twice as long as I expected. “No way” I thought…I got this. Well, they were mostly right. 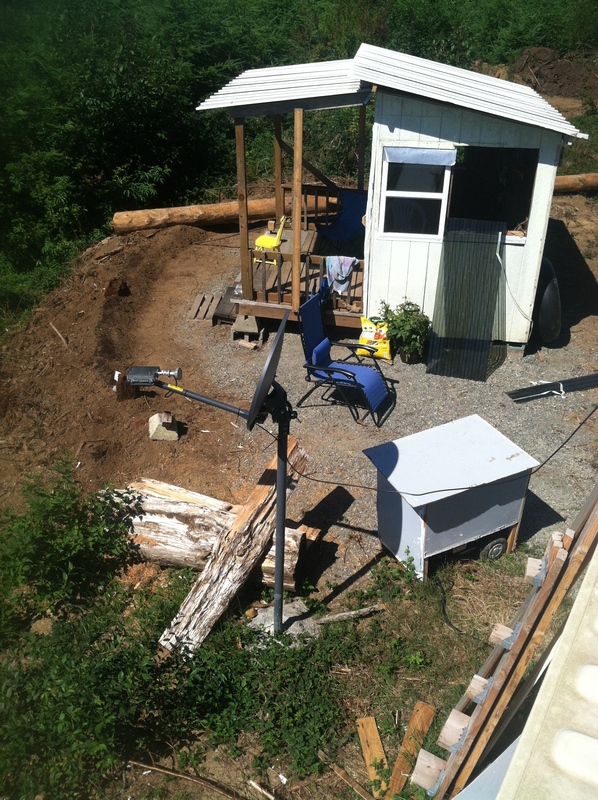 We fell logs in May and hoped to stack logs in July after the foundation was poured. It was September 15th before we laid our fist log. Long story. Let me say a few words to help those of you who are NOT GCs(general contractors) like myself. Read all your county building departments docs well. Ask questions. Over-plan your project. Leave no detail unturned. Even if you are ‘sure’ you will NOT need a building permit…my advice is to talk with your building department and share your plans anyway. Start a good relationship now. Shake out any issues NOW…not AFTER you’ve started. OK…enough ‘mothering’. My story: I knew that I could build a structure of 800 sq ft maximum WITHOUT a building permit. I also knew that it was only for an ACCESSORY building. OK fine I thought…this will be my garage(accessory) and next year will by my cabin. Quite by accident I walked into the building department and was proud of my progress (I had my forms up for my foundation). Until I found out that I needed a permit because my cabin was not built yet. There was nothing on our property for our garage to be an accessory TO! Sheesh…. OK…hence all the careful words above before beginning your project. You guys probably are not like me…shoot then aim…so you won’t have any problems. Good luck! 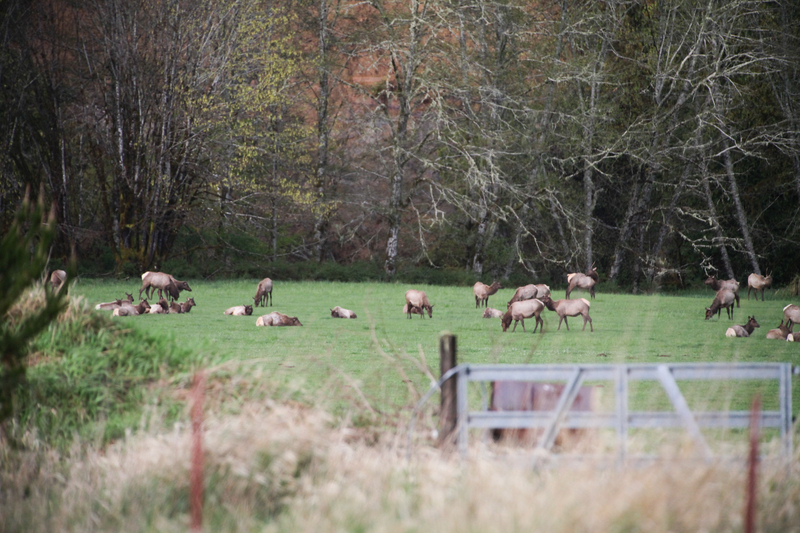 I’ve built many ‘elk camps’ in my time…but the camp we put together beats them all! 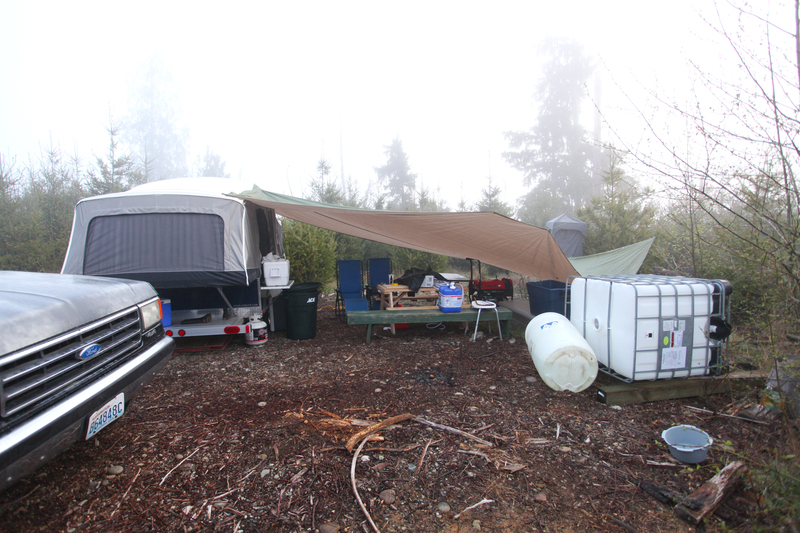 If you can picture our pop-up trailer parallel to a 10×20′ Walmart carport parallel to a 10×20 container. Space to live and space to store tools and equipment. Nice. To make a room ‘add on’ all I had to do was put up another tarp. Early on we also shipped our niece’s tiny house onto the property. We used that as our cottage. You’ll notice in the cottage photo a satellite dish. I told ya we didn’t rough it too much! 🙂 Our router and converter ran off our two solar panels. We also found enough power (stored in four 6volt golf cart batteries…wired as one 12v) to run our lights at night and battery charging. While we’re on the subject of power. The county gave us the quote of $37k to run power up to our cabin even though power lines ran across our property at the bottom of the hill(remember when I said “do your research and pay attention to detail”). OK…forget ’em! 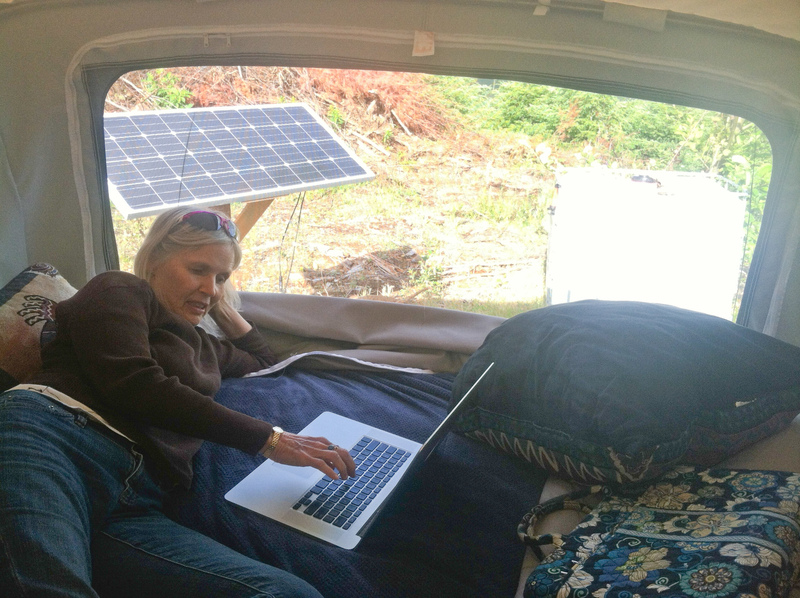 Let’s do this ‘off grid’…better yet! 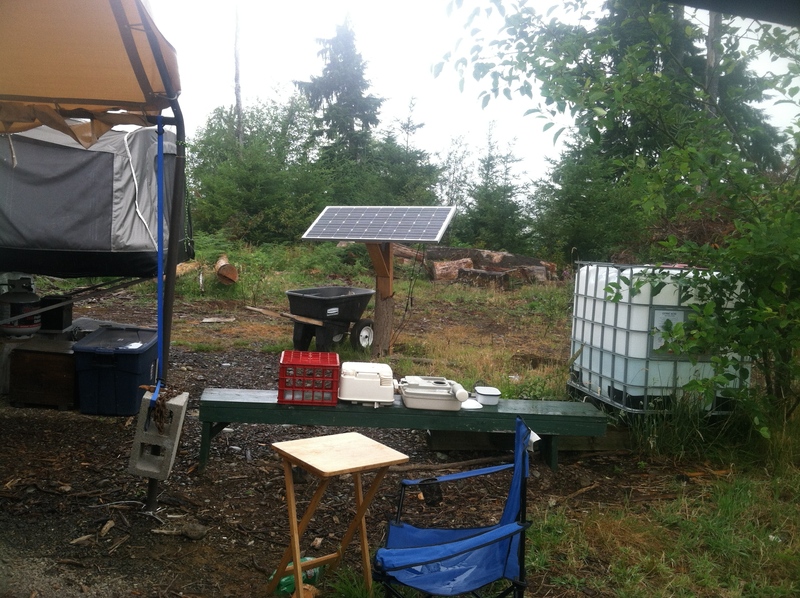 So far it has worked with a generator(mostly for running the well pump and power tools), small propane tanks for shower, stove, BBQ and trailer and our two solar panels. In the future we will add a large propane tank, enlarge our solar footprint and add a larger/quieter generator for the cabin. 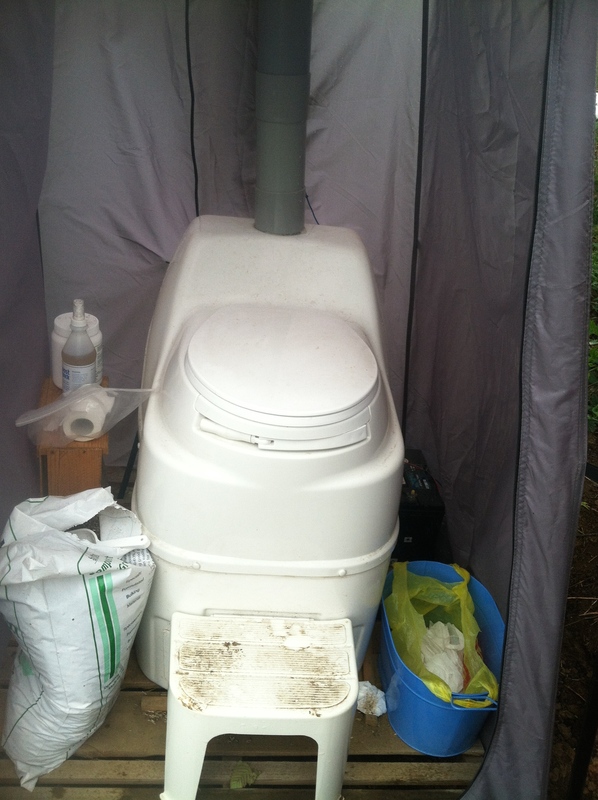 Our toilet had a fan running 24/7 by this small solar panel and a 12volt deep cycle battery. Even a bark-o-lounger for comfort!